The XPR-10AXLS model adds 152 mm of lift and extends the overall height by 152 mm. Taller people know that the difference between stooping and standing under a two-post lift can be the difference between severe back/neck pain and working in total comfort. Car ​lifts don’t offer taller lift carriages or get easier to work under than this. If you need maximum security and an extended working height that’s ideal for taller individuals, you need the BendPak XPR-10AXLS. This particular two-post lift features an absolutely massive 1,905 mm cylinder stroke, which means we did more than just extend the columns for the sake of overhead clearance. We actually lift the bottom of the vehicle ​152 mm higher than our standard two-post lift height. True safety requires taller carriages. Higher carriages eliminate balance issues that come into play when lifting trucks and SUVs. This model is truly something to get excited about. If your shop has the overhead clearance—at least ​4 metre—the XPR-10AXLS might be the best lift you ever purchase. The big n’ tall techs in your shop won’t forget it! The XPR-10AXLS offers tandem performing, low-pressure HVLP direct-drive cylinders that replace the lifting chains and screw-type mechanisms often featured on other two-post ​lifts. These direct-drive cylinders prevent leaks, are more reliable and run more smoothly than other systems too. Two-post lift operators generally prefer our Direct-Drive technology, as it requires fewer moving parts than chain-over ​lifts. Hydraulic fluid gets pressurized, starting at the power unit and flowing through the hollow cylinder rods. The downward motion of the piston rod raises the massive 1,854 mm lifting height while dual-synchro equalizers ensure a safe, even, worry-free ​lift. BendPak’s two-stage telescoping screw pads are second-to-none in strength and durability. That’s good, because we hope you’re going to be using this lift for decades. Gouge and tear-resistant polyurethane pads improve safety and ensure you’re not constantly replacing equipment. We even throw in a set of 63 mm stackable adapters when you purchase the XPR-10AXLS. Extremely low-profile contact pads are well-suited for compacts and sport cars. The dropped-end frame design makes your two-post ​lift arguably the most versatile lift ever made. Increases overall arm positioning for lifting a variety of wheelbases. Overall arm sweep and minimum arm reach are also extended to precisely lift vehicles that have unibody construction, OEM-recommended pick-up points and wide and/or narrow configurations. Our arm tube supports are kept low, maximizing clearance for vehicles of almost any size and type under 4,536 kg. Each telescoping arm has extremely durable restraints that engage when the lift rises and release as it lowers. This makes repositioning the arms fast, easy and always safe. The ​1,499 mm carriage height on the XPR-10AXLS is the highest in class for our two-post lifts. You’ll be hard-pressed to find a safer lift at a better value for your taller techs. Finally, tall mechanics can work ergonomically—no more painful stooping to get the job done. BendPak uses UHMW load bearings to protect your vehicle when it’s up in the air. These bearings are located at the pivot point where the telescoping arm meets the lift carriage. Ours are so well designed they’re virtually indestructible and should last more than the lifetime of your lift. Why make our columns a single piece of steel? It reduces stress and fracture points. Simply put, your car lift's columns are never going to let you down. 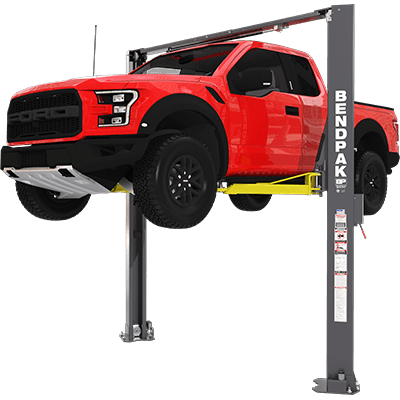 The foundation of every BendPak lift is built to last for many decades of continuous, heavy-duty use in a fast-paced shop. Safety is our main concern, and that’s no joke when lifting up to 4,536 kg. A single point safety release ensures two hands need to be on the ​lift during operation. This virtually eliminates pinch potential and other accidents that commonly occur on ​lifts made by less scrupulous manufacturers. A super-tall two-post ​lift needs a safety measure to ensure high-clearance vehicles don’t smash into the upper support beam. The padded auto-shutoff bar ensures ​lift functions cease the second a vehicle touches it.